I’ve always used cloth napkins. I mean, why not? They can even make a meager meal feel decadent! It’s a smart financial as well as environmental move for me. There’s no disposable plastic-wrapped paper napkins for me to buy over & over again & throw away! I’ve got cloth napkins that are over 20 years old. They still look great & are serving their purpose quite nicely. 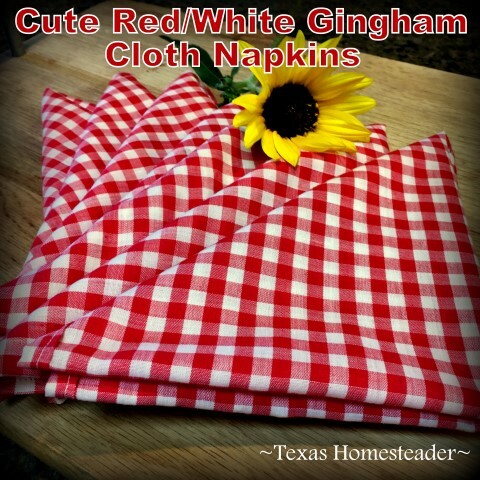 Recently I wanted some red/white gingham napkins. But y’all know how much I hate to get rid of this whatsit to buy that whatsit. It just seems like an environmental waste to me. But I REALLY wanted those cheery red & white napkins! So I started searching for gingham napkins in various shops and online. I could find them but DANG – they’re just a square of cloth. Even though I’d love to have the napkins, could I justify plunking down that much money when I already have very nice cloth napkins? Then I got an idea. What if I buy the fabric and make them myself? I’m not a seamstress (boy is that an understatement!) but surely I can hem 4 straight sides! Then the price would be much less. But although obtaining the raw fabric from a fabric store appeases the financial side of me, it still didn’t quite sit right with the environmental side of me. Both sides of me are important, so I put the purchase off for a bit. Then another thought hit me. HEY, what if I bought the fabric itself second hand? YEAH! My financial savvy side gave a big HIGH-FIVE to my environmental side! Woo-hoo! We were stopping by garage sales with my aunt & uncle who live out west when I spied the perfect red/white gingham tablecloth. It was wadded unceremoniously & crammed into a box of dusty, unloved assorted crap items beneath a table. I dug the wadded tablecloth out of the box, held it up & tried to appear totally uninterested & unimpressed as I asked the sellers how much. I almost couldn’t contain my excitement when they replied ONE DOLLAR! It was a small square tablecloth such as might fit well on a square card table. This will be perfect! So I brought it home and washed it up, hanging it outside on the line. Then I measured it out and decided to cut it evenly into 9 napkins. So I measured & marked my tablecloth and then cut it into squares. Now my problem with sewing seams on a square piece of fabric are those corners. By the time you fold each side under there are so many bunched up layers at the corners that it’s hard to smoothly get my sewing machine’s needle through it. So I learned this trick. Old hat to you accomplished seamstresses out there but brand-spankin’-new information for me! I first folded each corner down just under an inch and ironed it flat. Then I formed the side seams by folding about 1/4″ and tucking the raw edge under by folding again. The side seams met & came to a point at the corners but didn’t overlap each other. So the thickness of the corner wasn’t any thicker than the seams themselves. Yea! Your seam width will vary based on how much hem you want, but just fold until the side seams meet but don’t overlap at the corner. A quick press with an iron and I was ready to sew my new napkins. Done and DONE! 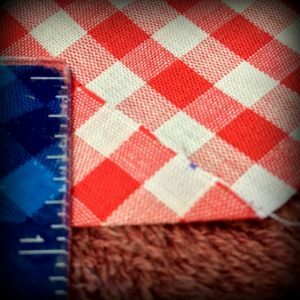 I sewed all the seams and I beamed with pride at my nine cute red/white gingham napkins. The finished size of my new napkins measures about 18″ square. I’ve always felt the 22″ size of my current cloth napkins at was a little large so I’m thrilled with both the look as well as the size of my new ones. 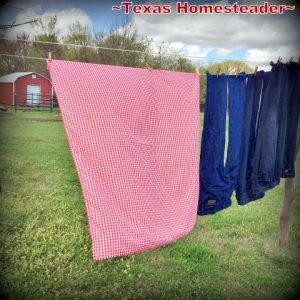 This entry was posted in Blog Posts and tagged Environment, Frugality on August 12, 2018 by Texas Homesteader. I have used cloth napkins for years, and made many of them. When my kids were young I changed my tablecloth and napkins for the seasons or holidays. I have a small drop leaf table that uses a 52 inch table cloth. I have even made tablecloths for my table. That was back in the House of Fabric days and they’d have midnight madness sales. That was back in the hayday of my quilt, apron, tablecloth, napkin, doll clothes or anything else I could think of to make. Cloth napkins and dish towels take the place of paper napkins and paper towels but do you have an alternative for toilet paper? Update on the Orca. Not exactly homesteading but important to all of us who care about the environment and all the creatures in it. After swimming 1000 (one THOUSAND) miles and losing weight and falling behind the rest of the pod, which now numbers only 75, she let the dead baby go. She is ok and eating and with her group now. This is the 3rd baby she has lost and the scientists just think she was grieving. Isn’t that amazing and sad to realize that with all the destruction we have wreaked upon the earth many people just don’t GET IT!!! If she had not been able to reunite with the pod she would probably have been in worse danger due to malnutrition. I guess they herd schools of their food fish so that everyone can eat. SO REMEMBER it’s not just one more plastic bottle it’s rafts of them in the ocean. When my friend moved out of state, she blessed me with many things she didn’t want to haul around, including several boxes of high end linen table cloths and a big box of blue linen napkins. She used to give dinner parties and cater banquets. I blessed an organization with the tablecloths, and I still use the napkins at every meal with my family. I just realized that I also have a red checkered tablecloth that I got from one of my many ‘decluttering hauls’. I have never been sure how to use it, but now I’m thinking a set of gorgeous, gaudy reed and white checkered napkins would be great! Thanks for the idea. I’ve always loved cloth napkins and seem to have acquired a zillion of them and have made some too. When we moved from work in Washington state back to Oregon My mother had a boatload of paper products and there is still 9/10s of a boatload of them left. Usually when a paper product gets used here it finds it final resting place in the compost bin or if not, in the fire place along with all the junk mail addresses, the rest of the junk mail gets recycled (pray that all the places that accept recycling keep doing so and that all the idiots stop putting disposable diapers in with the recyclables. Lastly, do you get the news about the Orcas (killer whales) in Puget Sound? They are a small pod, and they are in jeopardy, we’ve fowled up their food supply by fouling up the rivers with dams and stuff. One mother birthed a calf which was either still born or died shortly she has been keeping that dead baby with her for over 2 weeks now. They grieve and I can hardly stop crying about it. A 2nd calf that is ill has been swimming with it’s mother, but scientist recently were able to get close enough and smell it’s spout (or something like that) to make a determination and were able to administer an antibiotic or some med and were talking about trying to get live salmon to them. Every time I talk about this or even think about it I am in tears over it. One plastic bottle at a time!!! Sorry to have gone on and on and now I am crying. And I won’t even talk about forest fires stated by crazy people. Amen!!!!!!! Our individual steps – no matter how small – to reduce our environmental footprint add up. The whole is greater than the sum of its parts. Aristotle.